Windows Azure is a great cloud hosting option but it can be a bit tricky to obtain and maintain a permanent Static IP address, which is especially important if you need to connect to network assets behind a firewall that only allows known IP source addresses access to that resource. That’s why we integrated QuotaGuard Static IP’s on Azure Marketplace, to help solve this problem for our customers. The Windows Azure IP address assigned from your initial deployment only exists for the lifetime of that deployment, therefore, it can be a bit difficult to expand when you outgrow that original deployment Static IP address. If your application (or company security rules) requires your application to connect to an internal or external resource that only allows access from a known (white-listed) IP addresses, then the lack of a static IP address can be a real problem. QuotaGuard is a cloud service that allows you to route both inbound and outbound traffic through a Static IP address. Our service provides High Availability as our proxies are load balanced with additional fail-over protections in case any issues arise with the underlying hardware or one of your IP addresses. Even better, QuotaGuard is accessible as either a SOCKS5 or HTTP/HTTPS proxy so our service can be integrated in to any language and framework. 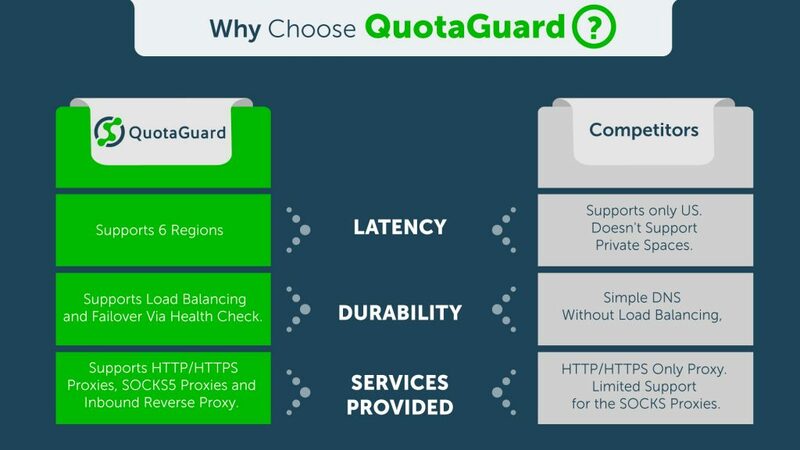 When you sign-up for QuotaGuard, you are immediately assigned two static IP addresses and a connection string for the proxy to route your traffic through automatically. Once you complete the simple configuration – that requires no coding changes in your application – you can route traffic to/from your app through the QuotaGuard proxy and appear to your target server to originate from your known and constant static IP. This approach works whether you have one or 100 Azure instances. We believe QuotaGuard is the most robust, scalable and cost effective way of getting a Static IP address on Windows Azure and we offer generous free trials so you can see if you agree. What are you waiting for, let’s just dig in and start setting up QuotaGuard on Azure together! As always, if you have any questions about our services or plans, please feel free to write us at our QuotaGuard Support Center so we can help find the right answers for you.